This large-size paperback is a ground breaking study on the idea that the Atlantis mentioned by Plato was in fact the Altiplano of the central Andes and it many megaliths and mysteries. The story of Atlantis is one of the great puzzles of ancient times: a great city that, according to the Greek philosopher Plato, sank into the sea in the space of a single day and night. Until now, no one has been able to pinpoint the location of Atlantis, nor prove whether it even existed. Allen documents a site in the high Altiplano of the Bolivian Andes that matches Plato’s description of the fabled land, as well as the local legend of a city sunk by earthquakes. Lavishly illustrated with satellite mapping, historical drawings and photographs from his own research in the field, Jim Allen concludes that the lost kingdom of Atlantis was an ancient civilization on the continent we now know as South America. After serving with the Royal Air Force, Jim Allen used his expertise in mapping and aerial intelligence to identify the location of the site of Atlantis. His research was the subject of a Discovery Channel documentary and earned him an honorary doctorate from Oruro Technical University in Bolivia. Chapters include: The Great Secret of the Indias; The Tomb of the Incas; Atlantis Today; Sinking into the Sea; The Circle and the Cross; Stones and Cactus; An Invitation to Oruro; From Tarija to Tiwanaku; The Dating Question; more. All color throughout. Imported from Britain. Published price: $35, our price only $19.95! 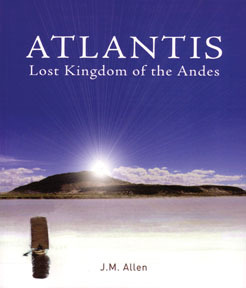 ATLANTIS: LOST KINGDOM OF THE ANDES By J.M. Allen. 208 Pages. 8x10 Paperback. All Color. Bibliography.